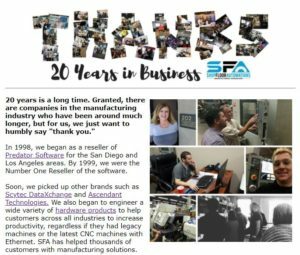 The November/December 2018 SFA email blast was a lean manufacturing newsletter. 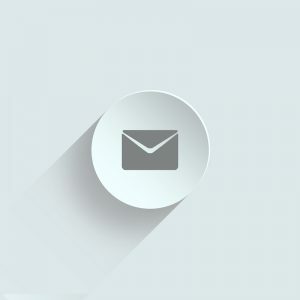 It was sent to subscribers November 19th, 2018. Heard of it? Thinking about it? Make 2019 the year to pursue lean manufacturing! Eliminate Floppy Disks: We offer plug and play solutions to replace CNC machine disk drives. We are a leading supplier for Haas, Mazak, Okuma, and Mitsubishi machine tools. Go Wireless: Increase baud rates and reliability by linking your machine tools wirelessly to your network. Any machine connection can be enabled via Ethernet or RS232 serial ports on your controller. Improve Machine Performance: Your ERP system is tracking job status and operator actions, but what is tracking the machine? Get real-time performance metrics on your equipment from anywhere you have internet access. Meet customer delivery dates and reduce unknown downtime. Looking for a great deal on a backup device to load NC programs into your machine? Tired of using a laptop and cables to load files? Purchase any USB Connect Pendant model, the USB Connect Portable unit, or any model of the LAN Connect at list price, and get a second unit for $100 Off! NOTE: Previous orders do not qualify and this deal expires 11/30/18. Eligible only for the products listed above. We will be closed the 22nd and 23rd for the Thanksgiving holiday. We hope you all have a great Thanksgiving with your friends and family. We are grateful to all of you. After-hours Support is available via our web call back form, 24 hours via our site. This archived issue of the Shop Floor Automations newsletter was first sent to subscribers April 24th of 2018. A brand new way to modernize your RS232 port is featured. There are quite a few organizations out there who are working to close the manufacturing skills gap. They are also teaching a trade to those who not only need the guidance but the steady career path that manufacturing provides. Shop Floor Automations (SFA) wanted to share with our audience a local organization called Rise Up Industries. Trainees of the program become machine operators by trade. They are also taught to overcome obstacles from their past to become productive members of society through various life skills classes. Their motto is “a place to belong” and we were very touched by our visit to their shop recently. We invite you to check out what they are doing over in Santee, CA! You have heard it from us before – you can add USB to your CNC of any make, model, and age. You may have also heard we can add Ethernet to your machines. Why not both? We present to you the LAN-USB Connect. This hardware packs a one-two punch. It’s easy to install, as it connects to your machine’s RS232 port. You can drag and drop files from, and to, your CNC machine memory. Use the Ethernet connection via FTP, and best of all, no special software is required to install and use the device! For more information, please call (877) 611-5825 or fill out our contact form. 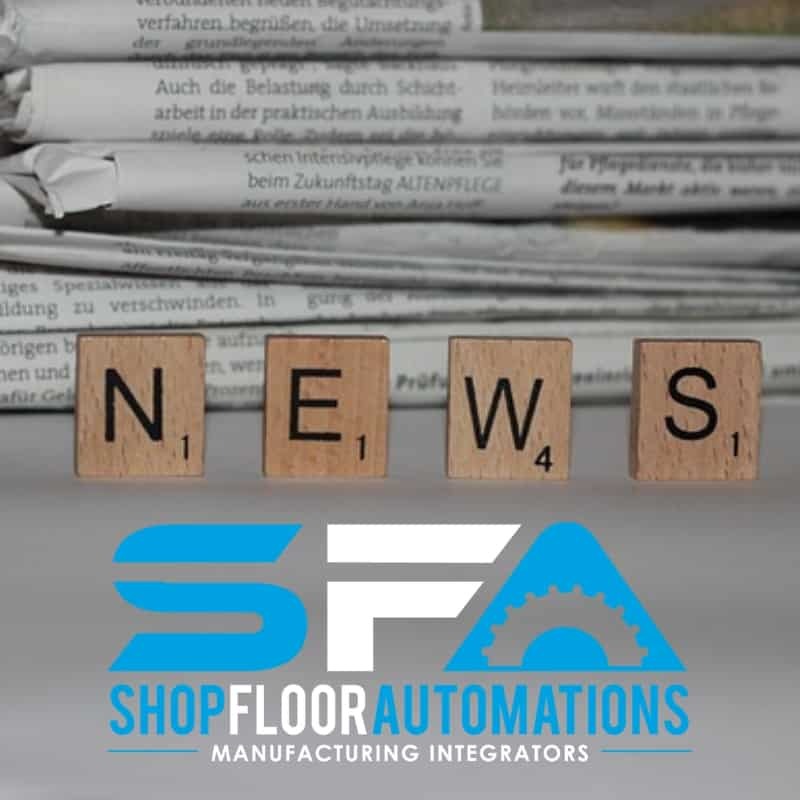 The following is an archived copy of the Shop Floor Automations newsletter from February 2018. Aerospace manufacturing plays a big role here. If you manufacture aerospace parts, there are two questions you need to ask yourself: Is your revision control as solid and secure as it should be? Do you know your utilization percentages? Knowing the answers could help you keep customers and grow revenue. Production Data Management (PDM) and Machine Data Collection (MDC) are two solutions that are critical to your operations. To learn how to improve your machine utilization/OEE and prevent old programs from running on your shop floor, visit our website. For example, Airbus – this major player in the aerospace division requires that new suppliers provide “a proven track record of operational reliability and delivering on shared commitments.” Even existing suppliers must “meet quality requirements, on-time, and on-cost.” On top of performance records, the Defence & Space department of Airbus specifically requires detailed document control (per Ref. ADS.E.0570 Issue 2, page 10 of 28). As you can see, aerospace companies such as Airbus have high standards for accepting and maintaining suppliers. Having data via machine monitoring software can help to provide proof of uptime, while PDM allows for document control. The Predator Software Suite provides both MDC and PDM, and Shop Floor Automations is the number one reseller and integrator of the software. Call (877) 611-5825 for pricing and integration information. This archived copy of the January 2018 SFA newsletter focuses on machine monitoring options. In 2018, you could increase your productivity by 25 percent, as well as take on lights-out manufacturing and make more profits without buying new machines. How? Machine monitoring can help you increase utilization and take an active role in making sure your machines are being used to their potential. Regardless of the manufacturing equipment you use or the industry you are in, your goals are the same: OEE, Productivity, and Profitability. 2017 was a monumental year for the manufacturing industry. Help the Made in America movement thrive by making sure your shop floor is as productive as possible. Shop Floor Automations is holding a machine monitoring webinar focused on DataXchange January 10th. Be sure to request to be part of this free event, while you still have time! DataXchange is the ultimate machine monitoring option for the manufacturing industry, and Shop Floor Automations is the number one reseller and integrator of the software. Call (877) 611-5825 for DataXchange pricing, which includes affordable Cloud-based options and on-premise solutions. We also encourage you to get in touch with our Sales department with further questions.